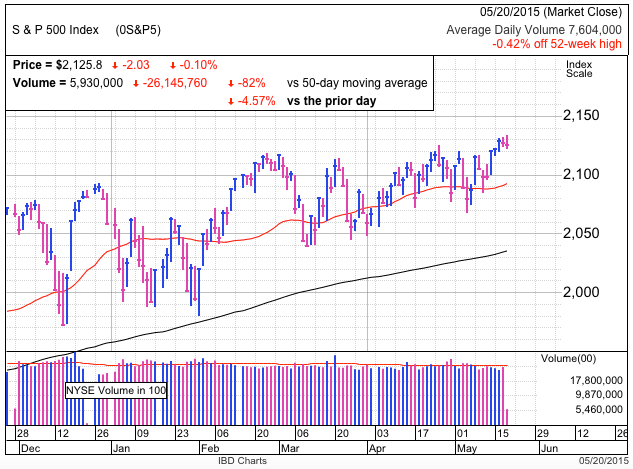 The S&P500 rebounded decisively from Tuesday’s selloff. We opened higher and never looked back, easily reclaiming 2,120 support. Volume was slightly below average and less than yesterday’s downday, but still respectable given this is a holiday shortened week. Today’s price-action poses a serious threat to the Bearish thesis. Yesterday’s selloff was the crack Bears needed to finally kickoff the long-awaited correction. Nothing shatters confidence like screens filled with red, and we had that in spades Tuesday. But as it turned out, the selling was quite limited as we quickly ran out of owners willing to dump their stocks for a discount. This tightening supply put a floor under the market and the selloff ended as quickly as it started. If this market was as extended and overbought as many claim, the smallest stumble would trigger cascading wave after wave of selling as panicked sellers rushed for the exits. That’s what happens when markets are unsustainably high, hence describing them as unsustainable. But the perplexing thing is rather than plunge lower, we keep rebounding to the highs. Looking only at the market’s behavior, it is fairly easy to make a compelling argument that this want to go higher, not lower. The problem many traders have is they spend too much time thinking about what the market should do instead of looking at what it is doing. If the market doesn’t care about rate hikes, employment, inflation, Greece, and all the other jazz, then neither should we. Something will eventually take this rally down, but it will be totally unexpected and not what everyone has been talking about for months. It was a dramatic day as the S&P500 plunged 1% in the first session back from the long weekend. As unnerving as it felt, volume was below average and we are only 1.4% off of all-time highs. Hard to claim this was a crash by any stretch of the imagination, but in the market perception is reality, and today felt a whole lot worse than it looks. Before the open, bullish sentiment on Stocktwits $SPY stream already fell to 41% and AAII’s bullish sentiment hovered near 5-year lows. As much as people try to correlate record prices and bullishness, we are anything but bullish at these highs. But this is actually a common phenomena. Every rally feels extended and fragile at the far right edge of the chart. Only months later do buy-points become obvious. If this were easy, everyone would be rich. The five months of sideways churn since the start of the year cooled off any overbought condition that crept into the market. While we could easily extend Tuesday’s selloff on Wednesday morning, using bearish sentiment as a guide, we are far closer to the end of the selling than the start. Once the last of the hopeful bulls bailout, supply will dry up and we will bounce. The best trades are the hardest to make and today it felt a lot easier to sell this weakness than buy it. Opening weakness in the S&P500 quickly rebounded and turned into a decent gain for the index. Overnight worries about Chinese manufacturing and European weakness faded as soon as we opened. While it was nice to finish in the green, we struggled with 2,130 again as we find ourselves stuck in a very narrow range between 2,120 support and 2,130 resistance. Headlines have given this market has every excuse to sell off, yet we keep making new highs. Too often the novice contrarian confuses price with sentiment. They assume high prices automatically equate to overly bullish sentiment and is why they want to bet against the trend. But the truth is price and sentiment are completely independent. Just as surprising, the contrarian trade is most often sticking with the trend while every else is convinced it’s gone too far and is about to correct. That is how we find ourself at record high prices while the AAII’s bullish sentiment remains 14% under historic averages and near five-year lows. It seems the crowd developed a fear of heights. 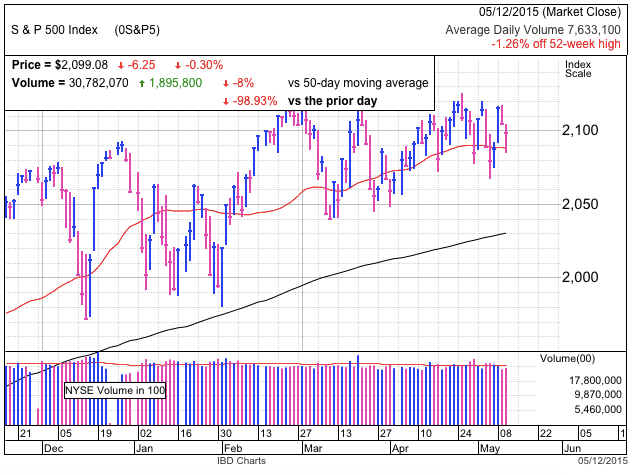 The S&P500 ended modestly lower in a day that saw it trade primarily between 2,125 and 2,130. There was an early dip to 2,122 that quickly bounced and a brief jump to 2,135 following the release of the Fed minutes. But neither divergence stuck and we finished inside the day’s range. The market moved higher following Fed minutes that pointed to a delayed rate hike, but we quickly returned to this morning’s levels once everyone realized we already knew that. For all the build up, the minutes were forgotten barely two hours later. But this retreat from the highs is giving bears something to crow about. It is surprising how vocal they are on a day that saw us set fresh highs. They complain about bullish optimism, but getting excited over a 0.4% dip is definitely stretching for something to gloat over. 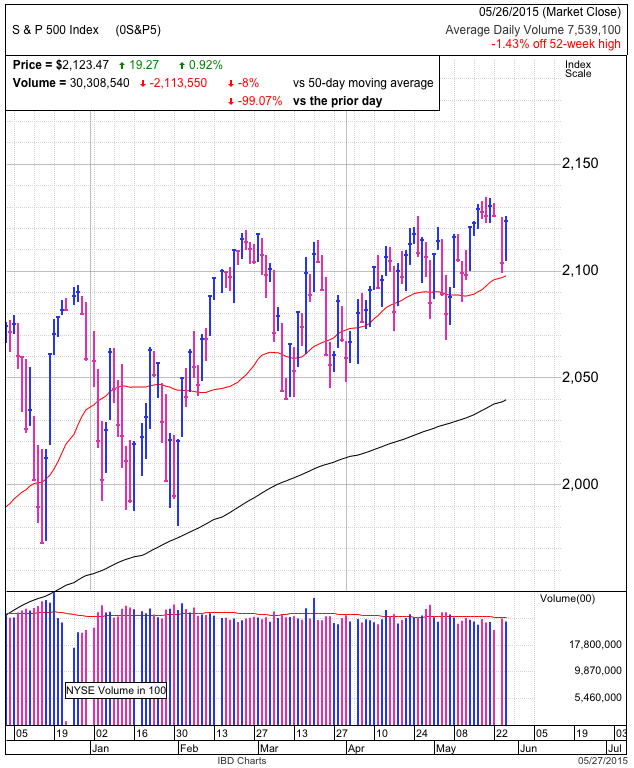 This was the market’s fifth consecutive close above the widely followed 2,120 resistance level that stretches back to February. What was resistance becomes support and that appears to be the case here. Previous attempts at breaking 2,120 saw us retreat days later, so holding these levels for a week is encouraging. It’s not as great as seeing the market surge to new highs, but it shows we are not being overrun by a wave of profit taking since the current crop of owners appear far more content holding on for higher prices. Their conviction keeps supply tight and makes it easier for us to keep going higher. While this breakout feels different, we need to see it continue making progress. If we close materially under 2,120, that shows the lack of demand is even more powerful than owner’s confidence. Since confidence is so fragile in the face of falling prices, we need to be wary if we cannot hold support. The other risk is if we cannot escape 2,120 and continue trading sideways. The longer we over above support, the more likely it is we will slip under and trigger a wave technical and stop-loss selling. 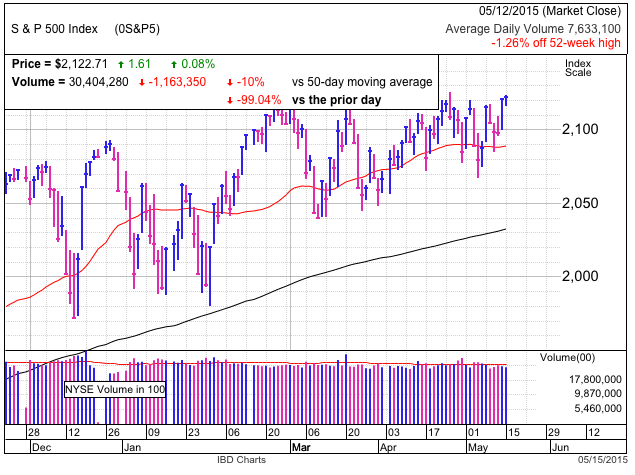 The S&P500 did a lot of nothing Tuesday as we consolidated Monday’s modest breakout. It stayed inside a 10-point range and closed lower by less than a tenth-of-a-percent. The benign trade tells us most owners are not taking profits and continue holding for higher prices, while those with cash don’t feel compelled to chase the breakout. When few change their mind, prices don’t move and that is what happened today. Every other time the market challenged 2,120 this year, we quickly retreated from the highs. Today’s close marks the fourth day in a row we finished above this widely followed resistance level, making this time different. While there are plenty of negative headlines making the rounds, none of them are new as we’ve seen versions these recycled headlines for months. Anyone who fears these issues sold a long time ago and is why periodic flare ups here or there no longer dent this bull market. Many claim this strength in the face of so many worries is irrational, but it makes perfect sense if you understand how markets work. When there is no one left to sell, we stop going down. If prices remain above 2,120, expect recent sellers and shorts to come crawling back as the fear of being left behind overcomes their fear of gloomy headlines. 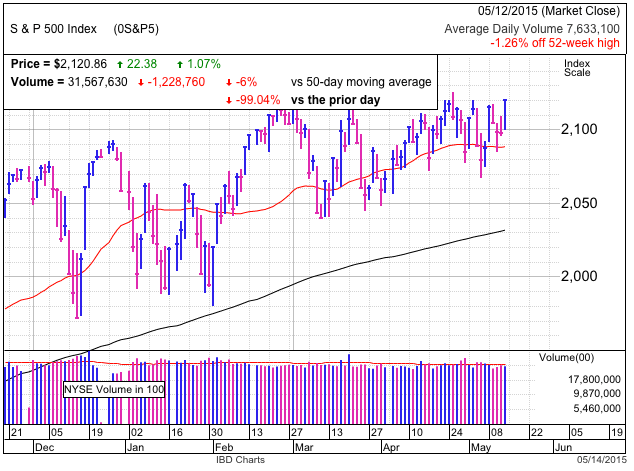 The S&P500 finished the week on a positive note. While Friday’s gain was less than 0.1%, it was enough to set another record close. We’re only up 0.3% for the week, but it was impressive because it includes recovering from Tuesday’s test of the 50dma. A couple of months ago we had a right to be concerned when the market failed to extend a breakout to record highs, and these thoughts were justified as we watched prices retreat from the highs in following sessions. But like everything in this game, sometimes a certain behavior means one thing, while under different circumstances it tells us the exact opposite. This time around, pausing at 2,120 actually feels productive. We saw early distribution, but it was fairly muted and we recovered into the green by the close. Obviously demand remains weak near widely recognized resistance, but we climbed this high because most owners are confidently holding for higher prices. And at least to this point, tight supply trumps weak demand. The interesting opportunity for bulls comes as we close in on the tipping point where reactive buying will boost demand for stocks. When the widely expected correction instead turns into a breakout, it forces pessimists to decide between buying in or being left behind. And that’s how melt-ups start. Seeing the market pause, or even pull back modestly here is constructive. What we don’t want is a retest the 50dma so soon after bouncing off of it. Keep holding for higher prices as long as we stay above 2,100. On the other side, be wary of a sharp move higher next week since that signals buying capitulation and leads to exhaustion. If you enjoyed this article, sign up for free email alerts to receive notifications when new content is published. Where Have the Bulls Gone? It was a record close for the S&P500 as we broke through the ever elusive 2,120. There was no real news driving this move, but it seems a lack of negative headlines is all we needed to push higher. It is a powerful sign when the price-action diverges from what people think should happen. Many claimed this repeated stalling at 2,100 foretold of the rally’s imminent demise. The nuance they failed to account for is the difference between stalling and pausing. Stalling is when the market stops rising on good news. Prices cannot continue higher when everyone who could be convinced to buy, already bought. Is that the case here? Are we topping on good news out of Asia, Europe, and the US? Are ragingly bullish headlines giving the last of the reluctant buyers the excuses they need to finally jump in? Hardly. We find ourselves in the exact opposite situation with an endless stream of negative headlines. Looming European financial crisis, lowered earnings estimates, disappointing economic reports, crashing energy sector, we’ve seen it all. And yet here we are, at all-time highs. If this is what the market does with bad news, what is going to happen something good finally slips out? The mistake many wannabe contrarian traders make is confusing price level with sentiment. Just because we are at record highs doesn’t mean the market is overflowing with bullishness. People scoff when I mention how bearish this market is. They cannot fathom how the crowd could be bearish when we are making record highs and they use this flawed logic to bet against the rally. Unfortunately, so many people hold this “contrarian” view that they are no longer in the minority. Doubting this strength has become the cool thing to do. The latest AAII sentiment survey backs this up, showing bullishness at a tepid 27% as compared to the long-term average of 39%. That is a stark contradiction to the widely popular assessment of how overly bullish this market is. A resistance level can only hold a determined market back so long. We’ve been trying to break through 2,120 for four months now and if we were going to tumble lower, it would have happened by now. The smart money is sticking with this strength, at least for a little longer. We will reassess once we see the speed, size, and quality of the breakout. Stocks gave up early gains and slipped back to 2,100. We find ourselves stalled again in this 2,100-2,120 zone where no one wants to buy. While I’d love to see prices explode higher, I’m not all that concerned about this morning’s price-action. It’s understandable that few want to buy since we turned back from this level so many times before. Those with gains are defensively locking-in profits and anyone with cash is reluctant to buy near obvious resistance. But with every passing day, we are inching closer to the point where all these people will need to buy. There are plenty of scary headlines coming from Asia, Europe, and the US. But all of them are recycled stories that we’ve been talking about for weeks, if not months. Does anyone still care if Greece stays in the Euro? I’m sure most European taxpayers and the financial markets would be happy to see them gone. Any major bank that still has unhedged Greek exposure after all these years deserves to go out of business. The US economy is growing frustratingly slow. Who could have possibly seen that coming? The Fed raising interest rates from the absurdly low 0%. That’s another shocker out of left field. Sarcasm aside, everyone knows these things. If owners held through last week’s spate of bearish headlines, more than likely they will hold through this week’s bad news too. Prices only move when people change their mind and so far these owners are proving to be an exceptionally stubborn group. The real pressure is going to be applied to recent sellers when they see the market take off without them. Their chasing is what will fuel the next move higher. That doesn’t necessarily mean the breakout will be sustainable, just that we are far more likely to hit 2,150 before 2,050. Depending on how many people are underweight this market and how acute the chasing becomes will determine how much further than 2,150 we go. But the longer we hold near the highs, the more likely it is we will smash through them. An ugly day in Europe spilled over to US markets. We gapped through 2,100 support at the open, triggering a wave of technical and emotional stop-loss selling that pushed us down to the 50dma. But as quickly as the selling hit us, it dried up and we bounced off 2,085. By the second hour of trade, we were safely back to 2,100 and the day felt much less ominous. 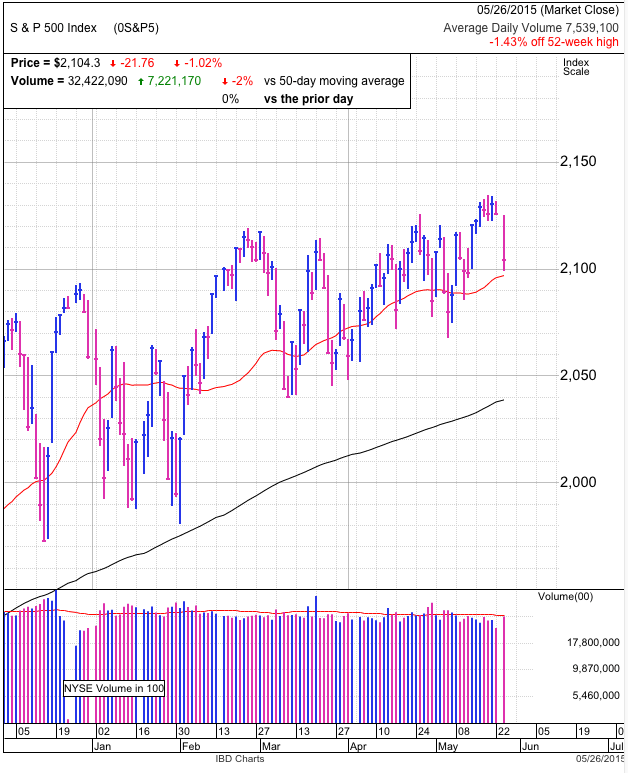 Since February, the market’s been stuck between a gently rising 50dma and 2,120 resistance. Everyone knows this ever tightening range will eventually resolve itself, the only question is which direction. Each time we reach the upper limits, buyers walk away and we stumble back into it. But just as reliably, each dip is met by indifferent owners who know we will bounce like every other time. As bears are finding out, it is frustratingly difficult to get a selloff rolling when no one wants to sell. Which side is going to flinch first? While there are no guarantees in this game, we can look to history for guidance. Overbought and unsustainable markets implode with breathtaking speed. They runup on euphoria, stall as the last the board the bandwagon, and collapse when everyone tries to leave at the same time. But this market is behaving in almost the exact opposite way. We have been trading sideways for months and every selloff stalls on complete indifference. Calm and confident owners are the last thing anyone betting against this market wants to see. But that is exactly what we have. Every attempted selloff is rebuked and the longer we hold near the highs, the more inevitable it becomes that we will smash through them. This market has been given every excuse to devolve into an emotional bloodbath. Scary headlines, big downdays, violating key technical levels. Every ingredient is there……..except the selling. When the market refuses to do the easy thing, then we know we have to do the hard thing, and right now that is sticking with this pig. Wednesday saw another high-volume selloff, this time triggered by unnerving comments from Janet Yellen concerning stretched equity valuations. 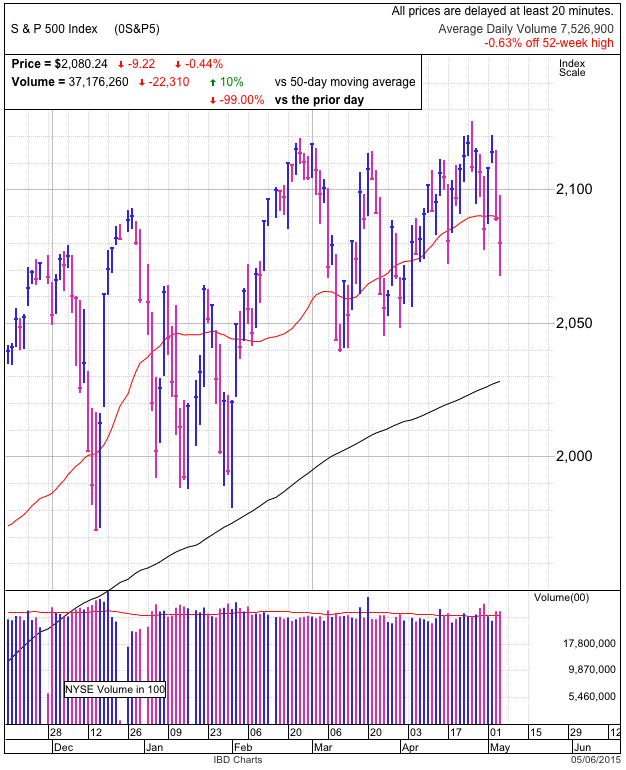 The index sliced through the 50dma and undercut recent lows in the 2,070s. While we finished in the red, today’s price-action is actually quite intriguing to the dip-buyer. We undercut recent lows, but rather than trigger an avalanche of reactive stop-losses, supply dried up and dip-buyers rushed in, lifting us 10-points off the intraday lows. Bears had a gift-wrapped opportunity to extend the selloff to 2,050, but the market bounced instead. Clearly there is still uncertainly swirling around the market, but this afternoon’s pause gives nervous owners time to more rationally form their next trading decision. 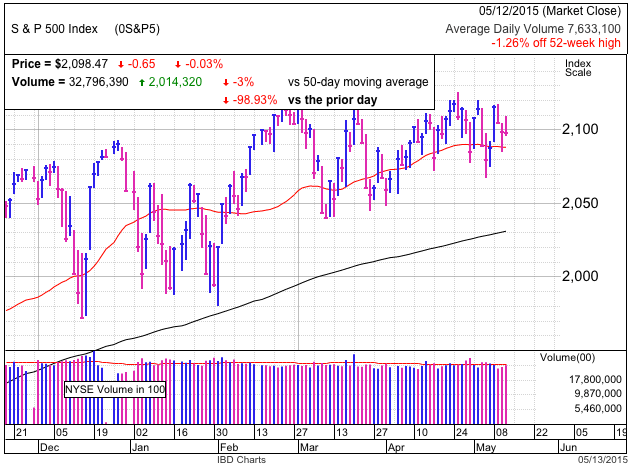 The last two-times we undercut the 50dma but finished off the lows, we saw strong rebounds the next day. Will tomorrow make it three in a row? If we reclaim the 50dma, there is a good chance the rebound will continue through all-time highs. There are two ways an over-extended market refreshes itself. The most obvious is by pulling back. But the second is churning sideways and grinding out the optimism. While we’re still within a couple percent of all-time highs, it’s been a trying year as the volatility chased off the weak holders. While everyone is still waiting for the widely expected correction, the longer we hold near the highs, the more likely we are to break them.